Made available for public purchase is this unique Sioux Native American Indian child's bow from the early to mid 20th Century. The bow shows a solid wood single piece construction and has been completely covered in red pigment mineral ocher paint and adorned with glass trade seed beaded linear designs. The bow shows an original sinew rawhide draw string that is still attached at one of the two notches. The center of the bow shows a wrapping of Buffalo hide whcih shows a heavy worn appearance. The beadwork is in chalk white, sky blue and red white hearts. The beadwork has been rubbed with a tree sap or something of the sorts to protect from bead loss due to the nature of a bows use. This bow would have been used by a young child to practice his hand at a bow. 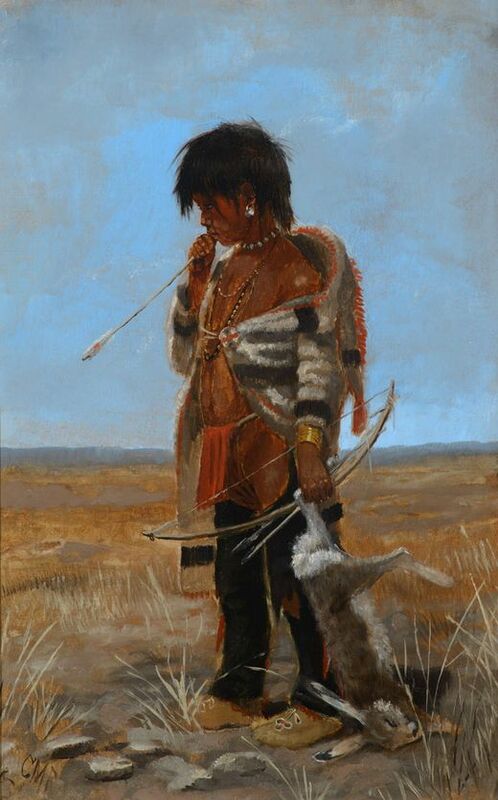 The Sioux would shoot arrows through hoops first to gain skill and later, once this was mastered, would attempt at shooting grasshoppers on the fly, an art very few could master. The bow measures overall 30.5"L x 1.5"W.